Info: 99% compatible socket replacement for Commodore SID 6581 and 8580. SwinSID is a hardware replacement for the legendary SID sound chip of the Commodore 64 computer. It is designed as a replacement that fits into the SID socket. The SwinSID emulates the sound of the SID chip but is lot more powerful and lets you experience the new dimension of C64 music. SwinSID X2 a device powered by a dual core ARM (hence the name) which can emulate two SID chips at once providing stereo output. SwinSID Micro a SwinSID in a smaller footprint. SwinSID Nano the smallest SwinSID. It has essentially the same proportions as the original SID. The SwinSID is not perfect but it comes reasonably close. 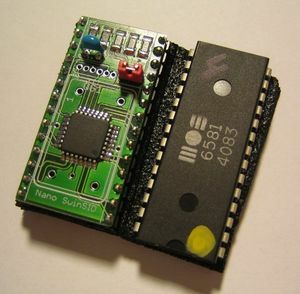 It has been described as sounding like a chip that stands like a variant of the SID that sounds closer to the version in the Commodore 64C than the original SID. Both revisions of Commodore's SID did double duty as the sound chip and as the control chip for input devices that rely on analogue resistors. Such devices include paddles and mice. As such a SwinSID equipped C64 will lose this functionality. There is a workaround of sorts: with a dual SID daughter board having the original SID in the primary position and the SwinSID in the secondary position will give the benefits of both devices. 199.229.249.191 00:24, 2 January 2019 (CET) : I can't tell the difference at all. If you are so obsessed with tiny little details in the most obscure SID modes then you are completely missing the point of the joy of the SID. It's the 6581 vs 8580 all over again. Once SIDs start failing, and the prices go up, and availability shrinks, we will be thanking developers like this for the incredibly hard work, instead of bashing them as "sterile". TheRyk: "I keep my fingers crossed for the developers but do not really believe this hardware will ever be a proper replacement. Recent (2014/15) firmware updates did not really change the fact that SwinSID sounds sterile — in the best cases — and totally spoils .SID files in worst case (check out Daglish tunes). Rather expensive toy if you consider that you can buy original ICs for about 10-20€ at the moment." This page was last modified on 2 January 2019, at 01:25. This page has been accessed 16,637 times.